The recent Fox News three-part series on NY hasidim did little to endear Jews to our fellow citizens – not Satmar (and it could have been any of several other groups without changing the effect), and not other Jews who might very well bear the brunt of any hostility generated. Elizabeth Llorente had the luxury of telling it like she saw it. She did not have to be subtle in depicting her subjects. There was no reason to think that people would resist finding fault with a strange-looking group of people who had flown under the radar for decades. Nonetheless, I can’t say that I detected any animus or bias in Elizabeth Llorente’s handling of her topic. As an outsider looking in, she was not unfair. Some in our community will yell – as they always do – “anti-Semitism” whenever crimes and misdemeanors are discovered – oblivious to the fact that everyone today is fair game. The screamers have convinced themselves that the core goodness of our community is so obvious and manifest, that only a hater would fail to see it. How we wish that were true! To be sure, she got some things wrong. She cited a host of people whose tell-all autobiographies cashed in on their experiences in hasidic communities. Some of those are serious people with compelling stories. Others are troubled souls who deserve our sympathy – but not our faith in their veracity. They spun tales that were ludicrous, and cynically took advantage of a readership that thirsted for scandal, whether true or not. Llorente failed to distinguish between the serious writers and the self-promoters. The charge that the election of frum members of local school boards allows them to steal money from public school students and divert it to yeshivos has been adequately belied elsewhere. Parents of non-public school students are also stakeholders in school boards, because the law entitles their schools to compensation for certain mandated services, textbooks, and transportation. The frum members cannot do more for their constituency than make sure that they are not cut out of the picture when there are budgetary shortfalls. To an extent, that is defensible. (More on that later.) It certainly isn’t theft. On the other hand, the leader of the campaign in one community against eruv presented as a fool. It was as simple as that. Llorente did nothing to make him look less foolish. And Llorente did concede, as did others who did exposes on NY hasidim, that most members of the community were quite happy to be there, and had no interest in trading places with anyone else, something acknowledged even by those who left it. Some of the positions attributed to hasidim in this three part series of both text and video clips are troubling and problematic. I use the word “attributed” deliberately. What you hear/read was not necessarily offered in response to the questions linked to them. Editors do lots of nasty things – sometimes innocently, sometimes deliberately – by cutting and pasting. It has happened to me – on multiple occasions! Keep in mind that any quote that sounds awful may be perfectly acceptable if it was given in response to a different question than the one used in the published version. Be that as it may, what viewers and readers saw and read contained some disturbing sequences, regardless of how they got there. This series was not just another article in one of myriad journals. Fox News is big. It is where a plurality of this country is most comfortable getting their news. The images it creates will linger. The airing of extremely harmful ideas about part of the Orthodox community in the most public of forums leaves the rest of us with unenviable choices: either defend the indefensible, or declare that they are not us. One strikes at our sense of truth; the other at our connection to other observant Jews, with whom we disagree about many issues, but with whom we share the most important things in life – our commitment to Torah and mitzvos. The best defense that the Hasidim came up with against the charge that they are gaming the system of government entitlements is that it is entirely legal. This is true. It is a deeply flawed system, and many groups take advantage of it, all staying within the limits of the law. There is nothing illegal in doing a better job than most groups in filling out the documents, so that yours get approved. But there is also nothing illegal in those others learning to hate you – in feeling that they have become patsies whom you are conspiring to divest of as much of their money as you can. Are they expected to simply accept that it is their tax dollars that are keeping your system afloat, and feeding its growth, generation after generation? Have we Jews forgotten that we are more vulnerable than all of those other groups who are doing the same, but are not going to pay the same price? What do we think happens when the following is projected on the screen in bold, large font letters, are allowed to linger? The average yeshiva graduate: •speaks little or no English, •has few or no marketable skills, •earns a household income well below the average Brooklynite’s, •marries young and has many children, and •is forced to rely upon public assistance to support his large family. 50-70% of Hasidic Jews are on public assistance. Especially the last line. Do we think they are going to love us for this? Interestingly, the first Fox segment mentioned that the Vizhnitzer Rebbe zt”l was against frum people taking over local school boards, thinking it too provocative. What is everyone else thinking? Have we forgotten to be mindful of what others think? Are we shallow enough to believe that what is legal is necessarily ethical – or wise marketing for ourselves? 3) The contempt that the spokesman showed for others included casual racism – the very racism he attributed to others. He reported on an attempt to mix Jewish kids with non-Jewish kids at an event in the same school district. He pointed with pride to the fact that none of his kids had ever heard a particular four letter word beginning with the sixth letter of the alphabet. On the other hand, the “Latino” kid kept liberally describing things he didn’t like with a different four letter word, prompting the spokesman to pull his team after a half hour, declaring that the game was over. Our side was not going to run the risk of being contaminated by the other . But any point he scored in showing the innocence of the Jewish kids was offset by attaching a label-of-origin to the offending party, displaying animus for an entire group. The Fox series was no cause for celebration. It displayed much that we would have preferred to stay hidden. This is not to say that we should not openly speak of our problems. There are better ways to deal with flaws in our own precincts. Noticing the title of a recent piece in Mishpacha, the needle of my worry-meter immediately crashed into the right margin. Here we go again, I thought. Another cover up by members of our community who never seem able to own up to major problems within our hallowed walls. I was dead wrong. Shlomi Gil’s piece (“Over the Green Line,” June 6) on charedi smuggling was no whitewash. If anything, it was a study how to deliver a troubling message to people without them tuning out before you make your point. The author could have pleased some readers by excoriating customs officials around the world for targeting Orthodox Jews, thereby showing their anti-Semitic bias. He didn’t. Alternatively, he could have zeroed in on fault lines in the charedi community, real or imagined, as others would have done. He could have charged that the culprit for the smuggling scandals (including one in which the grandson of a charedi MK was implicated in smuggling drugs in his tefillin) is wholesale disregard for dina de-malchusa. He could have pointed to the failure of a one-size-fits-all system of chinuch to provide options for those who don’t fit, turning them into easy marks. He could have blamed insularity so complete that the mules have no idea of what they are carrying, or why. He didn’t do any of that. Gil was more clever, more balanced, and more subtle – and therefore came up with a piece that worked. He wrote with sympathy for those caught up in smuggling operations, neither absolving them of guilt, nor demonizing them. He left room for the more open-minded reader to search for the ultimate causes for the behavior, without spelling them out. He conceded that many in the community find a thrill in “getting away” with breaking rules that are not organically part of codified halacha. Doing this, he did not accuse an entire community of being above the law, but at the same time asked them to contemplate whether they were not, in many cases, prepared to take liberties that they should not be taking. He directed the wrath of the readership to a place that can go some genuine good – the handlers and highers-up in the smuggling operation, who operate within the charedi community, and think nothing of putting the lives of others at risk. He provided facts and figures about the number of people who are caught, and the efficiency of customs personnel, which are certain to raise the eyebrows of those who believe that people who don’t look like them are easily deceived. Those who think that the best way to influence people is to compose a tweet in caps, or to join the Robert De Niro/Samantha Bee school of rhetoric, should study this piece to find a better way to communicate a lesson that the audience is not so eager to receive. And, between the pieces in Mishpacha and Fox, all of us are going to have to find ways to magnify kiddush Hashem before the chilul Hashem sweeps us, in time, into a vortex of Jew-hatred. one would wonder whether the comment writers at Fox are the usual trolls or reflect american reaction to this element of jewish society. because the jewish hegemony of the tri-state area enables behaviour that is , as RYA points out , legal but malodorious. and the tenor of the comments is that the public dole is allowing these people to breed like rabbits, and then they will try and blockbust your village…. one advantage of ‘out of town’ is that in small numbers it’s harder to pull shtick so haredim will seem less of a scourge. but at a price of not having the amenities that the vast numbers of the tri-state area enables [e g cheaper kosher, schools for the exceptional kids, state govt’s that must yield to such a large voting block, etc ]. it certainly would have been safer to have 300 communities across the country with 1000 frum jews than a couple with a half million…..
More than ever, we need high-level spiritual guidance. It’s not enough to act like every other interest group toward the government and society. We may be uncomfortable in being held to a high standard by those who hypocritically treat themselves to a low standard, but that’s normal in exile. Of course, our many Jewish organizations and media need to defend us, but they mostly need to inspire and elevate us. Whatever our true mission in exile is, we need to discover and complete it as we ramp up to our redemption. As part of this, our political activities need to be above reproach. We don’t belong in anybody’s pocket. We can’t let ourselves absorb bad influences from the people we must deal with. When in government, we can’t back immoral courses of action the leaders try to push. Excellent article. We have ro realize rhe difference between free exercise of religiom and acting like a proverbial chazer. Disgusting. This really makes me wonder how much anti-Semitism throughout history has been self-inflicted. about the inability of many to use the host’s sponsored job training in Lakewood due to almost total ignorance of anything not limudei kodesh], and the public dole is built into the economic blueprint of much of this society? So, Tachlis – what’s the solution here? All of the problems shown in the video have been around for millennia. The original Anti-Semite himself, Haman, already accused us of isolationism and of flaunting the law. That is exactly what he meant in saying עם מפוזר ומפורד…ואת דתי המלך אינם עושים . The Shas itself records for us similar accusations in both EY and Bavel. 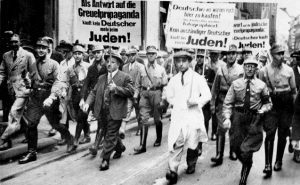 An honest assessment forces us to confront the uncomfortable yet historical truth that Anti-Semitism is an ineluctable by-product of living a halachic life among Gentiles. So what shall we do? We can’t just assimilate. And Halacha itself contributes to the problem. Shall we synthesize Judaism with Civics? Impossible. Synthesis attempts like TIDE and TUM and everything in between were always elitist, and never possible for the average Jew on the street. And the whole thrust of the Law is designed to prevent realistic social interaction. So, I’m asking you, RYA, what’s the answer? Aliyah is not a bad option 🙂 And do bear in mind that the Chasam Sofer wrote that people who go to Israel because they have no other place to run are NOT mekayeim the mitzvah of yishuv haaretz. If some of the shenanigans by some in our community keep up (and even if they don’t!) the changing West may not provide any alternative but aliyah. Might as well come when you’ll still get credit in Shomayim! I can’t agree with parts of your assessment. It is not impossible to synthesize Judaism with menchlichkeit and sechel. Entire communities have done it, including Yekkes and halachically-committed Modern Orthodox. These were not elitist communities. I also do not believe that the thrust of the Law is to “prevent realistic social interaction,” but to establish guidelines and protections for it. If the thrust would be prevention, Chazal would have done with both Christians and Muslims dictated during the Middle Ages, i.e. to have (almost) nothing to do at all with those accursed Jews. Never eat together. No fraternization. No walking on the same side of the street, etc. The protections that halacha gives us – kashrus in general, plus the specific issurim of pas, bishul, yayin – give a committed ample reminders that his friendship will have limits. For geographic areas in which there is a high concentration of all of one kind (Chassidish enclaves and among saturated non-Chassidish neighborhoods as well), they have a “we own the place” perspective. All of the people and homes around them are frum. There is a strong infrastructure of frum education, commercial stores, employers, political leaders, and human service organizations which thrive in this insularity, pretty much obviating the need for secular versions of those resources. This has created an entitlement to do whatever they want. The “other” to whom they are occasionally exposed is marginalized as being morally inferior based simply on their association with the rest of the world which is deemed immoral. The elitism manifests itself in public and private speech which certainly is contrary to the way that we (frum) Jews have always wanted to be viewed by others throughout the millennia. I did not see the program as we do not own a television. My problem with Satmar is the anti-Israel rallies they hold — they just filled a 17,000 seat hockey arena for one earlier this month. Was their anti-Zionism mentioned? It was not. It would have been irrelevant to the thrust of the piece. BTW, what is this “television” you refer to? A new kind of iPhone? Whatever it is, I don’t own one either. The series can be viewed through the internet, connection therewith you certainly have! That a spokesperson for Chasidim spoke in such a disgusting way was shocking. His use of foul language (in English and Yiddish) was ironic considering he was critical of non-Jews for cursing. How stupid is it to send forth a racist, foul-mouthed spokesperson who has no basic understanding of communicating a sympathetic message? We all know that making a positive impression is important. So is respecting other people (from all groups). Let’s work on that in all religious communities. Again, I caution you NOT to view the piece as linear, with the spokesman’s responses assumed to follow the questions that are raised. It may not have been the case. We should be able to imagine conversations about related topics in which his actual words would be strong, but not over the top. The blame possibly can be assigned to an editor, rather than the spokesman. We should not criticize him until we hear directly from him. My piece relates not to him, but the impact that the final product will have on the viewer. The words he used to express himself – which I will not quote here – don’t belong in the response to any question that could have been asked. Let’s say it was a direct question about the event – Why did you pull your children out of a joint youth group? What happened at the event? What was the problem with sharing space with Hispanic kids? Then the answer is: We want to build community, but unfortunately, some non-Chasidic kids were using curse words and discussing inappropriate topics but we value refined speech and we felt there was a negative dynamic” etc. Those words and the message they conveyed by the spokesman were NOT nice, not in any context, not as any response to ANY question. Every Shabbos where I walk to shul I hear young men playing basketball in a yeshivas playground whose vocabulary and values are antithetical to that of which we should ne aspiring. Thete is nothing wrong in viewing much og contemporary culture as toxic to growth in Avodas HaShem. For people who want to see the videos, google “fox news community in conflict”. There are actually more than just the 3 part series. @Leah b: I don’t agree that his use of profanity was wrong in this instance. He was trying to be concrete about what he claims was said there. It makes much more sense when you just say it than talk around it. I think there is one horrific statement in the Mishpacha article. It states, matter of factly, that smuggling is no more, or less, prevalent than general society. How can that not shock us and not lead to a communal cheshbon hanefesh and serious reflection on our chinuch and on our communal priorities? Hello you all must watch the videos because we are talking at cross purposes. David you missed the profanity I referred to. When HE was speaking about other matters, HE used the S word, the B word, the D word (in Yiddish). Ugh!!!! HE also made a point of emphasizing the non Jews’ ethnic background when it wasn’t relevant, claimed the nonreligious are “insane” and on and on. It was cringe-worthy. Hence this entire piece was written because Rabbi A clearly was distressed by the negative image that was created. Can the Chasidim call me next time they need a spokesperson? I am not a professional but I know how to be polite and speak in a refined way!!!! It doesn’t matter where you live. The parallels can be found. Yet, I think there are important differences. I don’t have the benefit of any solid research, or even a sustained effort at anecdotal evidence. My own sense, however, is that the vast majority of the charedi community does not have contempt for those outside. To the contrary, they are sensitive to the criticism that charedim are not carrying their own weight. They very much believe (with more than significant justification) that the learning and mitzvos they provide has a salutary effect on the rest of the country. They are pained by the fact that the others do not understand that. They are grateful to Tzahal, even as they believe that they would be placing their children in spiritual danger by sending them to serve. What they don’t seem to understand so well is the amount of justifiable antagonism that is reciprocated to them. Charedim tell themselves that they are providing a service, but those to whom they provide it do not see it that way. From their perspective, charedim perpetuate their lifestyle through their taxes, in a burden that they are no longer willing to bear. I don’t see, for the most part, an attitude of “We’ll squeeze every shekel out of them that we can. It’s the American – oops, I mean the Israeli – way.” Maybe with the exception of the politicians, and a vocal minority of the community. @Leah B: I wasn’t defending him in toto, just his explicit quotation of the work that the “hispanic” child uttered. But the crux of the problem is not how crude he was, but the fact that the system that he was trying to defend is in some ways indefensible. It would be better to reform things than to do better Hasbara. “If you knew anything about places like KJ, you’d know that there is only one option for school. Families who’s kids are kicked out have two options – keep the kids home, or uproot their family and move somewhere else. Not to mention that kids who are kicked out of Satmar, and even those who leave of their own volition, usually have a very difficult time getting accepted in any other Chareidi schools. The [members of] of the vaad [hatznius] are in fact out of control vigilantes will no oversight, who run amok terrorizing residents by breaking into homes, slashing tires, spreading pashkevillin, and so on. Take a look at the latest Jewish Action. There are two articles worth reading on the changes in the Charedi world re hi tech admiration for the learner earner and a fascinating yeshiva on Beitar Ilit whose RY discusded Yom HaZikaron. It is always inportant to remember that changes that come from within kn an evolutionary manner in such socieries are always preferable to changes imposed and directed by those whose views are culturally and sociologically hostile to such societies. @David Ohsie: Why should I believe one anonymous KJ resident over another? Either or none might be correct and unless you yourself live in KJ and know what goes on all over there, you can’t know who’s right. My guess would be that both commenters are half right: there’s more internet and smartphone access than you would imagine but if you’re indiscreet about it, you’ll get into trouble. The fact that we believe that Torah learning affords protection to Klall Yisroel does not justify the current system in Eretz Yisroel. Such a belief has never resulted in encouraging virtually every man to learn full time as opposed to working. Whoever should be learning full time should and his learning has salutary effect on the country. The rest should be doing what Jewish men have always done, supporting their families and devoting as much time as possible to learning.
. “Such a belief has never resulted in encouraging virtually every man to learn full time as opposed to working. “Not so obvious,that is the ideal even for the superior,there were Rabbis in the Talmud, who were choppers of wood and drawers of water. @Sarah Elias: Because the former KJ resident who I’m quoting is not anonymous and and neither are the people in the video. I just don’t have permission to post I that persons name FB here. That person has put themselves out quite publicly on this as have many others. The fake news guy is anonymous. I understand you may think I am lying. Read and you can find plenty of these people on your own.